Keith Hershberger's handmade cups are a sophisticated take on your favorite childhood creatures. The latest in dinosaur research found a fascinating new theory: Maybe our reptilian friends ran out of juice? Keith Hershberger's beautiful handmade earthenware mug is a sophisticated take on your favorite childhood creatures, because, let's face it, you never stopped having prehistoric fantasies. Each is hand-stamped with a graphic contour, dipped in an elegant glaze, and finished with a surprise silhouette on the bottom. Choose a diplodocus, triceratops, or tyrannosaurus, and bring the dinos out of extinction, at least for your water breaks. Handmade in Pittsburgh. Make it a set of prehistoric pals. 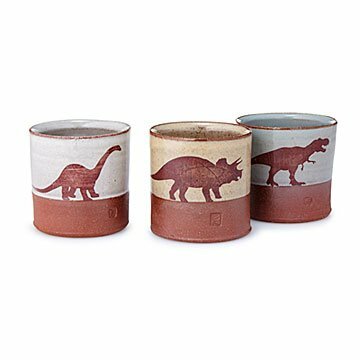 Add the Dinosaur Bowls and Dinosaur Mugs to your collection. Keith Hershberger is a potter living in Pittsburgh, Pennsylvania who has made a living working in clay for over 20 years. As a child he spent countless hours drawing dinosaurs, and with his line of dino mugs, bowls, and cups he found a way to bring some of that carefree childhood joy into his ceramic work. These dino dishes seem very well made and I hope my nephew can enjoy using them for years to come. They're perfect for his morning cereal and milk/juice. I'm very happy to get him something handmade & unique! Love the "secret" patterns on the bottoms of the pieces!